when beaded with pearls and glass beads. 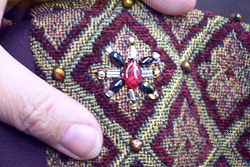 Brocade fabric on a Lady's Gown or Lord's Cotehardie is beautiful all by itself; but, for a truly magnificent presentation it only takes a little time to embellish your brocades with beads. It's lots of fun and easier than it looks. Most people are afraid to add beads to their garments because beading looks difficult and they are worried that the beads will come off. If you follow this simple technique you will find that it is both easy and very secure. I have a knitted sweater that I beaded 15 years ago and it hasn't lost a bead yet even though I have run it through the laundry many times. Step 1: Choose your beads. They should be large enough to be seen on a busy brocade background. Seed beads and most bugle beads are too small for bold brocade patterns. 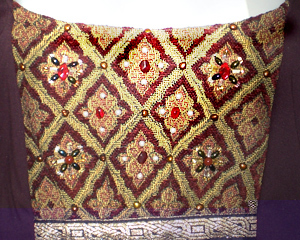 Look for collections of beads in colors that complement the brocade. These are sold in craft stores for making necklaces and bracelets. I always look for flat beads and half pearl shapes as well as round pearls and glass beads in jewel tones. Rice shaped beads are good for making the rays on starbursts. In this example I will be using square cut bugle beads, iridescent black rice beads, big glass seed beads, white pearls, copper half pearls, and big red glass beads in various shapes. The dress in this article is the Catherine Gown, item (Discontinued at this time, 2009). Other brocade items that are good for beading are available in the Lord's and Ladies clothing lines at Renstore.com and much of it is on sale this week. Step 4: Lay out the beads to get ideas. colors to come up with best designs. Step 2: Choose a needle that will pass easily through the beads. You may need a needle threader with such a small needle, too. Step 3: Choose thread that has a high tensile strength—polyester or silk thread, for instance, is higher in strength than cotton. It should be as thin and strong as possible. I am using black polyester sewing machine thread. It is very inexpensive yet tough. Thread the needle with a single thread and knot it at one end. 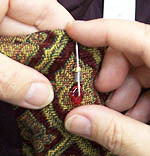 Using doubled threads can cause a jam inside the bead making it difficult to pull the needle through on the second and third pass. Step 4: Experiment with the beads, laying them on the brocade fabric to get an idea of how you can enhance the brocade pattern with your beads. Sometimes less is more. Just a few strategically placed beads at the junction of each motif in a lattice and a few strabursts around the neck and shoulders is enough. You don't need to bead every inch of a gown for it to look spectacular. Another thing to remember is leaning against round beads can be very uncomfortable. If you bead the back of a garment, use only half pearls, small flat beads, and bugle beads. I came up with two basic designs, a star burst and a simple 4-pearl pattern, and combined them for this piece. See the picture at the beginning of the article. When you have an idea of what beads will go where you can begin. I like to use small wooden boxes with hinged lids to store my beads. Keep the beads in little zip lock bags and only place a few beads of each color into a small tray or oriental sauce dish while you work. If you only work with a small number of loose beads at a time, you will have less to pick up if they get knocked over. Step 5: If the garment is lined, pin the lining and outer fabric together around the area where you will bead. Do this on a body or a dressmaker's dummy. If you skip this step, the lining could easily slip and you will end up sewing the lining to the outside in a way that could cause odd puckers and wrinkles. Begin beading by pushing the needle up through the fabric in the center of the motif and sewing through the hole in a large red glass bead. Repeat sewing through the fabric and the bead three times. The number of repetitions is what secures the bead, not the number of threads inside the bead; so, even if you use a double thread, you will still need to go through the bead 3 times. Try to avoid sewing through the lining except when tying a knot or starting a new thread. Your work will look neater and there is less chance of lining puckers. Pass the needle through the fabric to the back and tie a knot by taking a small stitch and passing the needle through the loop of thread before it closes. Then proceed the same way to the next bead always going through each bead 3 times. Step 6: If you have sewn a line of beads and you find that the beads are not "marching in a straight line," sew back through the centers of each bead with one long stitch to make them line up. If you run out of thread before you reach the end of the line of beads, overlap your second long stitch by 2 or 3 beads to keep the two sections lined up. Step 7: Tie off your threads on the back by sewing a couple of small back stitches passing the needle through the loop before it closes to create a small knot. Now pull on the bead. You can feel how securely it is attached! Care for Beaded Garments: Glass beads are very hardy and can be washed and dried in the laundry. Plastic beads with pearlescent coatings can be washed but not dry cleaned. Always consider the washing instructions of the garment, too. Do not put beads that can't be dry cleaned on a dry clean only garment. When in doubt, hand wash and line dry. Unless the garments are heavily soiled just airing them out and brushing off the dust with a stiff brush will usually suffice between wearings. The less you wash your fine garments the longer they will last. If you want to add this article to your list of favorites or email it to a friend, please use this permanent URL, https://stores.renstore.com/-strse-template/0711A/Page.bok. Permission is granted by the author to quote from this page or use it in handouts as long as you include a link back to Renstore.com.